Would you look both ways if you knew cars would always stop? Adam Millard-Ball, assistant professor of environmental studies. Imagine an urban neighborhood where most of the cars drive themselves. What would it be like to be a pedestrian? Actually, pretty good, according to Adam Millard-Ball, assistant professor of environmental studies at UC Santa Cruz. In fact, pedestrians might end up with the run of the place. In a new study, "Pedestrians, Autonomous Vehicles, and Cities," published online Wednesday (Oct. 26) in the Journal of Planning Education and Research, Millard-Ball looks at the prospect of urban areas where a majority of vehicles are “autonomous” or self-driving. It’s a phenomenon that’s not as far off as one might think. self-driving vehicles, with a focus on yielding at crosswalks. Because autonomous vehicles are by design risk-averse, Millard-Ball’s model suggests that pedestrians will be able to act with impunity, and he thinks autonomous vehicles may facilitate a shift towards pedestrian-oriented urban neighborhoods. However, Millard-Ball also finds that the adoption of autonomous vehicles may be hampered by their strategic disadvantage that slows them down in urban traffic. The benefit of crossing the street quickly, instead of taking a long detour or waiting for a gap in traffic, is traded off against the probability of injury or even death. Pedestrians know that drivers are not interested in running them down—usually. But there is the chance a driver may be distracted, drunk, or a sociopath. Self-driving cars are programmed to obey the rules of the road, including waiting for pedestrians to cross. Secure in the knowledge that a car will yield, pedestrians merely need to act unpredictably or step into the street to force the risk-averse car to stop. the arrival of the automobile more than a century ago, Millard-Ball says. Parking, street design, and transit and paratransit service networks are likely to be revolutionized. 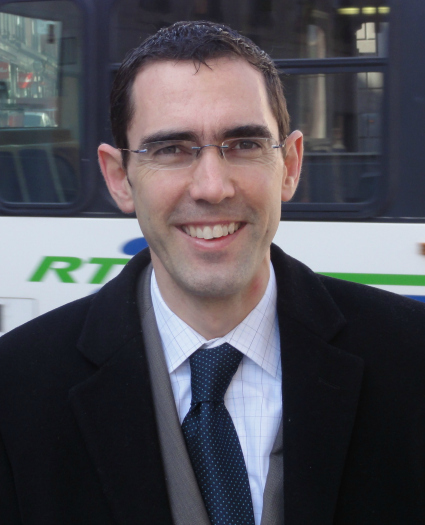 Millard-Ball’s research links urban planning and environmental economics, with a focus on intersections between climate change and transportation policy. In a previous article, he looked at parking strategies in urban environments that might reduce the practice—and environmental costs—of circling the block to find an open spot. In his latest study, he also suggests that the potential benefits of self-driving cars—avoiding tedium of traffic and trauma of collisions—may be outweighed by the drawbacks of an always play-it-safe vehicle that slows traffic for everybody. “From the point of view of a passenger in an automated car, it would be like driving down a street filled with unaccompanied five-year-old children,” Millard-Ball writes. The ultimate impacts of autonomous vehicles depend not only on technological advances and market adoption, but also on how planners and policy makers respond, Millard-Ball concludes. One approach would be to maintain traffic speeds by eliminating crosswalks, erecting fences between the sidewalk and roadway to corral pedestrians, and stepping up enforcement against jaywalkers. Alternatively, planners could seize the opportunity to create more pedestrian-oriented streets, and relegate drop-offs to the fringes of urban commercial districts. Autonomous vehicles could usher in a new era of pedestrian supremacy.